Should the U.S. expand its forces in Afghanistan? That will be the debate this week. (CNN) -- What you'll see in Washington in this week is a White House focus on health care and jobs. What you won't see -- or see much of, at any rate -- is just as critical a challenge for the administration. On Wednesday and then again on Friday, President Obama will meet with his national security team to continue deliberations about Afghanistan strategy, including whether to commit as many as 40,000 more U.S. troops to what not too long ago was "the forgotten war" but is now front and center. "Ideally, it's better for military advice to come up through the chain of command," National Security Adviser James Jones told us Sunday when asked whether the very public request for more troops from the commanding general in Afghanistan had complicated the White House deliberations. Significantly, Jones, a retired Marine Corps general, offered what sounded like a more optimistic asssement of the security challenges in Afghanistan than the commander asking for more troops, Gen. Stanley McChrystal. "I don't foresee the return of the Taliban," Jones said. 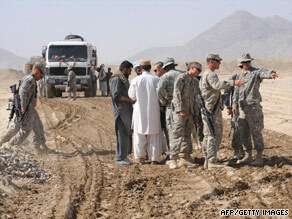 As for al Qaeda and its strength within Afghanistan, Jones added: "Very diminished. The maximum estimate is less than 100 reported operating in the country. No bases. No buildings to launch attacks on either us or our allies." His comments left little doubt Jones is not only less than thrilled about McChrystal's public appeals, he also is among those skeptical of sending more troops. Suffice to say those private strategy meetings warrant considerable attention. Easier to see will be presidential and vice presidential events pushing health care reform and promoting the administration's stimulus plan as, contrary to what Republicans say, a cushion keeping a sluggish economy from taking an even bigger toll on American workers and families. • The first new Supreme Court term of the Obama presidency kicks off, and Sonia Sotomayor gets down to official business as the nation's first Hispanic high court justice. • The Senate Banking Committee on Tuesday discusses potential new sanctions against Iran, proof of congressional skepticism even though Iran over the weekend agreed to let international inspectors visit its recently disclosed uranium enrichment plant. • Wednesday is the eighth anniversary of the beginning of the war in Afghanistan. • Wednesday also brings the Federal Reserve's latest report on consumer credit.